Carl’s Jr. was founded in Los Angeles in 1941, but has since expanded beyond the United States to countries such as Canada, Japan, Malaysia, Brazil, Russia and Denmark. For a franchisee, renewal or extension of their existing agreement will enable the franchisee to continue operating the business, maintain their goodwill and provide them an opportunity to sell their business and/or assign their rights, hopefully for a reasonable return. The non-profit organisation, TED, is dedicated to spreading ideas through the medium of powerful talks and you’ll have heard my frequent reference to them. Watching one a week over lunch is an item I’ve belatedly added to my New Year’s Resolution list (is that cheating?). It joins my renewed habits of daily meditation (wow the impact!) , .gym and yoga classes to make this year’s list my most successful ever – thanks to my mentor Paul Blackburn, founder of Beyond Success. An eye-opener for me – the MUST HAVE skill every team member and franchisee needs to succeed – a very valuable 13 minute TEDx video. Put it by for the weekend. Worth every cent of the $50 special price. Works on audio too! 🙂 PS I’m not on a commission! As a business owner or manager, should you focus on clients or customers? What separates the good companies from the great? A personal favourite, we refer to Jim Collins in our workshops – here’s some more from the great man. What separates good companies from the great? This was the topic of a three-hour session with business guru Jim Collins in Melbourne on Tuesday. It has been 19 years since Collins last visited Australia and it was just the third occasion that he has presented his work outside of the US in the past 12 years. Everyone raves about our new Lauren Clemett segment on Brandworking at our workshops and there’s more of the topic here: The psychology of colour in your marketing. Note: Like to learn more about Lauren then go to http://ultimatebusinesspropellor.com/ and if you’d like an introduction contact me. And oh yes, she’s written a great book by the way. I’m delighted to be welcoming Dave Jenyns, founder and CEO MelbourneSEO Services to our team of franchise savvy experts. Dave’s just been invited to the Netherlands to present a TED talk and will be available for you, our members, to conduct coaching sessions with you on online marketing and highlighting what can be done to improve the impact of your content and website visibility. Thank you everyone who sent me their choices for my new book title. 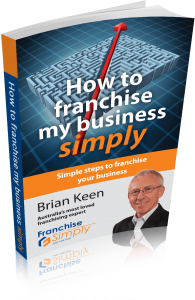 “How Do I Franchise My Business?” won the day and will be published next month. The initial response has been terrific and we’re all excited about it I can tell you. Is it time you wrote your expert’s book? Contact us to find out how we can help you become ‘Australia’s Most Trusted Authority’ in your space. You’ve Got A Question Or Comment? I’d be delighted to hear from you, simply send me an email and of course I’m always happy to have a chat. Why 96% of Your Customer Say Nothing, But Just Quietly Leave!